Whether on the beach or in the mountains, a vacation home offers some tax advantages. 1. Can You Deduct House Insurance on Schedule A? 3. Can I Write off a Mortgage Insurance Premium Paid at Closing? A vacation home can provide you with a number of valuable tax write-offs, even if you don’t write off a primary residence -- perhaps you're renting a home, living with someone else, or you own your home outright. The IRS treats vacation homes much like primary residences and allows you to deduct many of the same deductions for your second home as you would for a first home. In order to take advantage of tax write-offs for a vacation home, you must file a form 1040 and you must itemize your deductions. Your vacation home must meet the IRS definition of a qualified home: it must be a house, mobile home, condominium, cooperative, house trailer, house boat, or other lodging that has sleeping facilities, cooking facilities and toilet facilities. A tent, tree house or other such structure that doesn’ t meet these requirements doesn’t qualify. If you finance the purchase of your vacation home, you can deduct the interest you pay on your mortgage loan. The loan must be secured by your home in order to be deductible. For example, if you borrow money against investments you own and use this money to purchase a vacation home, the interest on the loan isn’t deductible. You can deduct the interest you pay on the mortgage each year. If the loan was issued by a bank or other financial institution, you’ll receive a 1099 from the lender each year, showing the amount of interest you paid and may report on your taxes. If your seller carries the mortgage, you’ll need to track the interest yourself. You can also deduct the property taxes you pay on your vacation home each year, whether you pay these taxes directly to the taxing authority or through an escrow account with your lender. You can’t deduct any fees associated with these taxes, or special assessments for items such as street paving or sewer improvements. 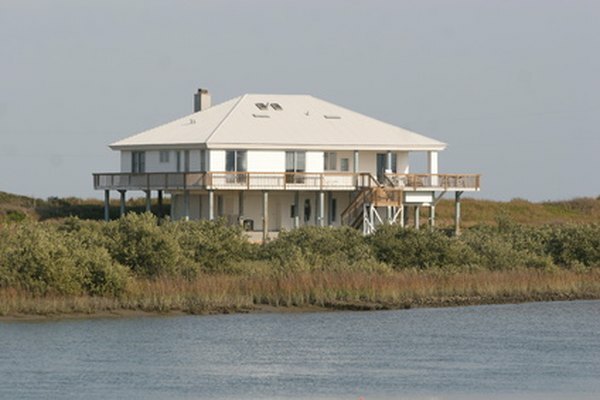 Insurance on your vacation home can provide another tax deduction. The IRS limits the amount of interest you can deduct if your adjusted gross income exceeds a certain amount. For example, in 2011, if you were married filing jointly and your adjusted gross income was $109,000 or more, you couldn’t take the mortgage insurance deduction. If you rent out your vacation home part of the time, you must also stay at the house at least 14 days during the year, or more than 10 percent of the time it’s rented out, in order to claim tax deductions related to the house. For example, if you rent the house for 200 days, you must stay there more than 20 days in order to write off your mortgage interest, insurance and property taxes.